Teaching Retelling Strategies with Leveled Literature—with FREE Download! Hello there. It’s Rich from Mr. Giso's Room to Read. Once again, I am thrilled to be back with a chance to share some ideas with you. In the age of the Common Core, there has never been more of an emphasis on challenging our primary readers with more and more informational text, and rightfully so. This time, however, I’ve decided to bring us back to some good old fiction. That’s right, you heard it correctly—shh! This post is one for the classic characters in children’s literature. Today, we'll look at the complete Mrs. Wishy-Washy set of the Joy Cowley Early Birds series. These texts, which feature a character we all know and love, are perfect for my early readers, as they are leveled C–G using the Fountas and Pinnell text gradient. In this series, we get to make wonderful music with Mr. Wishy-Washy; discover that the farm animals have gobbled up Mrs. Wishy-Washy’s pie; solve the mystery of the missing corn; laugh at the pig, duck, and cow not knowing about reflections in the mirror; and meet a new, most unwelcome addition to the Wishy-Washy family: a hissing cat. These adorable titles are perfect to use when introducing retelling to your young readers. I suggest you do this by making a “retelling necklace,” an idea I learned from reading Linda Hoyt. First, I always plan to model a new strategy with the whole class, using a big book or a regularly sized text that I can project onto my interactive white board. 1. Select appropriately leveled texts and assign texts to groups based on like reading levels. Texts should be fiction and narrative in structure. 2. Students read their texts with a teacher, with a buddy, or independently. 3. Students use four index cards. On the first one, they record the title of the book, the author and the illustrator. On the remaining cards, they number them 1, 2, and 3. 4. Then they illustrate, in pencil a key event in the beginning (1), middle (2), and end (3). 5. Students use the illustrations to retell in writing what happened in the story using the graphic organizer. 6. Students' work is edited. Then, the students copy each event on the back of the appropriately numbered illustration (lines side of the index card). Punch holes in each card and tie with ribbon or yarn. 7. Students have a book conference with a buddy who had a different book. They read to each other and retell the story using their necklaces. Usually, I have my young ones wear their necklaces throughout the day so that they can retell what they read to various members of the school community. It’s a lot of fun. To get the directions and recording sheet, you can download it at the bottom of this page. On another note, while using the Mrs. Wishy-Washy books in the Joy Cowley Early Birds series, I discovered how well they lend themselves to the types of higher-order, over-arching questions we need to ask in order to scaffold our young readers’ comprehension. I came up with many follow-up questions that address the theme of the text, text evidence, the author’s craft and some inferences based on knowing the familiar characters. Here are some examples. I’d like to take this opportunity to wish you all a very happy New Year filled with fun, adventure, learning and, of course, reading. I’m now on Instagram. Follow me at mrgisosroomtoread. To download the directions and recording sheet for the retelling activity, click the "Making a Story Necklace" image below. 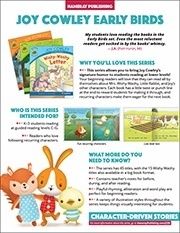 For more information about the Joy Cowley Early Birds series of leveled readers, visit our website, or click the image to the right below to download a series highlights sheet.